Throughout the first two decades of her reign, the Queen's jewel collection expanded even further through a combination of gifted pieces and personal acquisitions. Here are ten of the pieces that she received throughout the '50s and '60s. 51. The New Zealand Silver Fern Brooch: The women of Auckland raised money to buy this diamond and platinum brooch for the Queen. The brooch is shaped like the frond of a tree fern, which is one of the national symbols of New Zealand. It was presented to her on Christmas Day 1953 during her post-coronation tour of the Commonwealth. The Queen was the first reigning monarch to visit New Zealand, and she has often worn the brooch at events related to the country throughout her reign. She also lent the brooch to the Duchess of Cambridge for her visit to New Zealand in 2014. 52. The Australian Wattle Brooch: On the same Commonwealth tour, the Queen was presented with a diamond and platinum brooch in Australia. The wattle is Australia's national flower, and it was presented to Elizabeth by the country's prime minister. (Her visit to Australia was also a first for a reigning monarch.) The brooch includes diamonds in shades of white and yellow, and it's an absolutely eye-catching piece. She continues to wear it regularly today. 53. The Brazilian Aquamarine Tiara and Parure: The Queen's impressive diamond and aquamarine parure came together in pieces. In 1953, the necklace and earrings were presented to her as coronation gifts by the people of Brazil. Four years later, she had a tiara made to match the earrings and necklace. In 1958, the Brazilian government added two additional pieces to the set: a bracelet and a brooch. And in 1971, the Queen decided to make some changes to the tiara and had it supplemented with additional elements, transforming it into the tiara she still wears today. 54. The Belgian Sapphire Tiara: In 1963, the Queen decided to add an additional tiara to her arsenal, turning the sapphire suite she received as a wedding gift from her father into a more complete parure. The piece she purchased was a converted necklace, and it had a royal legacy -- it had previously belonged to Princess Louise of Belgium, a daughter of King Leopold II (and a distant cousin of the Queen through the Saxe-Coburg and Gotha family). She wore the tiara regularly for decades, and it still shows up very occasionally today, including a surprise appearance at last fall's Chinese state banquet. 55. 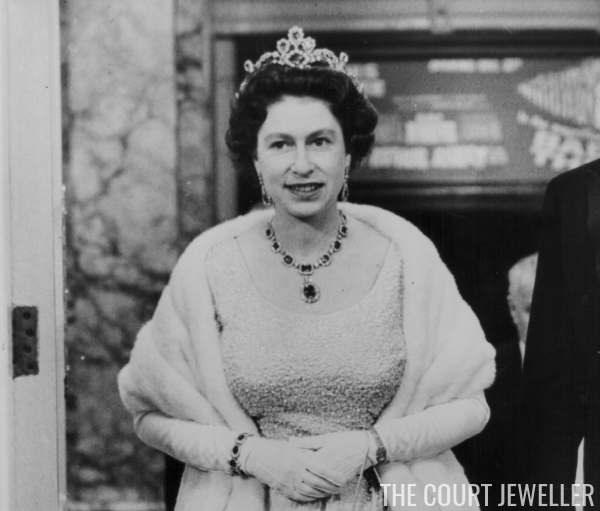 The Baring Ruby Necklace: The Queen purchased this diamond and ruby necklace in 1964; it was an easier-to-wear ruby option for gala events than the Boucheron necklace she had received from her parents in 1947. (She should have had the crown rubies in her jewelry box at this point, but as we'll see later, they were elsewhere.) The Queen still wears this triple-pendant necklace occasionally today. 56. The Godman Necklace: In 1965, an exceptionally grand diamond and emerald necklace was offered to the Queen by a pair of elderly sisters, the Godmans. They believed that it had once been owned by Empress Josephine of France. Although the connection to Josephine was eventually proven false, the necklace is a magnificent example of nineteenth-century design, and it's easy to see why the Queen decided to add it to the royal collection. We don't see this piece nearly enough today -- it's tough to wear with the gala necklines that the Queen prefers -- and I'm hoping to see her lend it to another member of the family in the near future. 57. The Grima Ruby Brooch: This modern ruby, diamond, and gold brooch was given to the Queen in 1966 by the Duke of Edinburgh. It was designed by British-Italian jeweler Andrew Grima, who also dreamed up jewelry for the Queen's sister, Princess Margaret. The Queen still brings this piece out occasionally for events today. 58. The Jordanian Turquoise Demi-Parure: The Queen received this suite of diamond, turquoise, and sapphire jewelry from a fellow monarch: King Hussein of Jordan. The set includes an intricate necklace and coordinating earrings. Unfortunately, the Queen rarely wears the demi-parure, although she has sometimes brought it out of the vaults at Jordanian-related events. 59. The King Faisal Necklace: Another gift from a fellow monarch, this diamond and platinum necklace was presented to the Queen by King Faisal of Saudi Arabia during a state visit in May 1967. The piece was made in 1952 by Harry Winston, and it features 356 diamonds weighing a total of more than 83 carats. In the 1980s, the Queen lent the necklace to Diana, Princess of Wales, and in more recent years, she has also loaned it to the Countess of Wessex. 60. The Frosted Sunflower Brooch: At some point in the 1960s (or very early 1970s), the Queen acquired one of her very favorite brooches -- this diamond and gold bauble shaped like a sunflower (or, others have argued, like a dahlia). The piece was made for the Queen by Garrard, and tallying up the number of times it's been worn over her reign would be a mammoth undertaking. It's still one of her most frequently-worn brooches today.